If you are looking for an online dating site that is dedicated to helping Christians meet other Christians then Christian Mingle is an excellent option. They are one of the leading Christian dating sites for singles and have been around for many years – since 1996 to be precise. With a lengthy history, a good reputation and regular advertising Christian Mingle has built up an impressive membership. 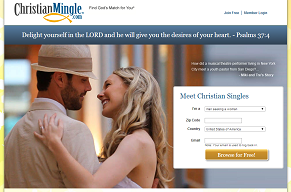 You can join Christian Mingle for free and, although functionality is limited, this gives you a chance to try the site out and get a feel for it before parting with any money. The website is well designed and easy to use, and 24 hour telephone assistance is available. There is a strong community at this dating site and plenty of active members means you have a good chance of meeting someone suitable for you. Signing up at Christian Mingle involves answering a number of questions, including questions about religion. The information that you provide at this stage forms your basic profile and you can then go on to add more details. The sections for your profile are quite extensive, so you can create a very informative profile if you want to put the effort in. It is particularly worth spending some time filling out information about what it is you are looking for in any potential matches. There is a selection of tests you can take as part of you creating your profile too. If you take the “Readiness IQ Test” you will receive a report that assesses how ready you are for a serious relationship. The Color Code Personality Profile is a series of questions that help define certain aspects of your personality. The COMPASS survey gauges a number of factors relating to personality and compatibility. These all help you find out more about yourself and are also used to help match you with other members on the site. There are essentially two ways you can find potential matches at Christian Mingle. There is an extensive search facility that allows you to search for other members based on a whole range of factors and the site can provide you with matches based on the information contained in your profile. The matching process is more effective if you have undertaken the COMPASS survey, and you can also search specifically for other members that have taken it. The standard choice of options for contacting other members is available here, and you can use the email feature or instant messaging to get in touch with someone that interests you. You can also send smiles as an informal icebreaker, and there is an option to send customized e-cards too. You will need to be a paid member to send and receive messages as this function is not available to free members. We’ve already covered the main features at Christian Mingle, but there are some additional features worth mentioning too. The message boards, for example, help foster the community aspect of this dating site – they are very active and you will find discussions taking place on a whole host of different topics. Then there is the Worship Centre, which is basically the hub of the religious aspect. Here you can take part in discussions relating to your faith and Bible studies, or make prayer requests. There are also a couple of features that you can use to make your profile stand out at the site. These are premium features that you have to pay extra for, but they can give you a better chance of being noticed and contacted by other members. You can pay for a spotlight listing, which will display your profile in a prominent position, or a stand-out listing, which will display your profile in a larger size and different background color. There are three different payment options at Christian Mingle. If you just want to pay for one month a time, this will cost you $34.99. If you pay for three months at a time the cost is $56.97, which brings the amount per month down to $18.99. The cheapest option is to pay $83.94 for a six month membership, which works out at just $13.99 per month. Please note that we have quoted costs for US residents, and they will vary if you live in other countries. Christian Mingle has a lot to offer, and it is easy to see why it is one of the more popular Christian dating sites around. There is a large base of active members, which means you should have a good chance of finding some compatible matches. The site is user friendly and functional, and the costs are reasonable. If you are a Christian single looking to meet other Christian singles then this is a dating we are pleased to recommend.